This week, we have been working on cause and effect text structure. Cause and effect is deceptively difficult for young readers. On the surface, it seems simple--cause and effect text structure just shows causes and effects. Easy, right? In text, however, causes and effects are often more difficult. Cause and effect text structure often has a strong chronological aspect. Causes always come before effects. However, many authors of cause and effect texts state the effects first. Why do writers do this? In many cases, the effect is more interesting than the cause. Authors start with the cause to get the readers' attention. In other texts, the causes are somewhat mysterious or counterintuitive. The author puts the effect first in order to build some suspense and show how the causes were discovered. Texts that are organized like this present a problem for the standard cause and effect graphic organizer. Where to put the cause? Where to put the effect? Should an organizer reflect the way that the text is organized? Or should it reflect the way that the causes and effects happen in real life? I lean toward representing ideas as they actually happened instead of how they appear in the text, and this is what I've done with my fourth graders this week. (I generally try not to mess with the rules of causality.) A clever reader could probably play around with an interesting way of representing these ideas in a way that shows both the order in the text and the order in real life. Look for causes and effects in real life: There are many opportunities throughout the school day to reinforce cause and effect. When the announcement came on Thursday morning regarding indoor recess for the millionth day, I said, "The cause is cold weather. What is the effect?" and the students groaned, "Indoor recess." Sometimes you can create chains of causes and effects. -The revised Figurative Language pack is available. Lots of standardized test practice if that is on your mind right now! -Links to videos are on my Reading Videos Pinterest board, along with indications for which texts or activities they go accompany. 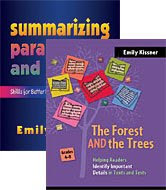 -I'm working on materials for comparing texts...write to me at elkissn@yahoo.com if you'd like to field test some comparison charts and texts! Peregrine Falcons, Chronological Order, and More! -Chronological order text is similar to narrative structure. -Chronological order matches what students experience in their lives. -Chronological order is easy to understand and analyze. After reading the text, we went online to check out the peregrine falcon cams. Our local peregrine, up the road in Harrisburg, was at the nest when we checked. And she laid her first egg between Tuesday and Wednesday! This was so amazing. Kids started going back to the text to see when the eggs might hatch. After we worked through the animal life cycle texts, I wanted students to experience a procedural text. Procedural texts exist in kind of hypothetical time. They do not explore events that have actually happened, but look at steps in a process. We talked about the organization of procedural texts as I displayed a few examples of recipes and crafts projects. Then, students read the "Fabric Scrap Easter Eggs" text from Chronological Order Texts. 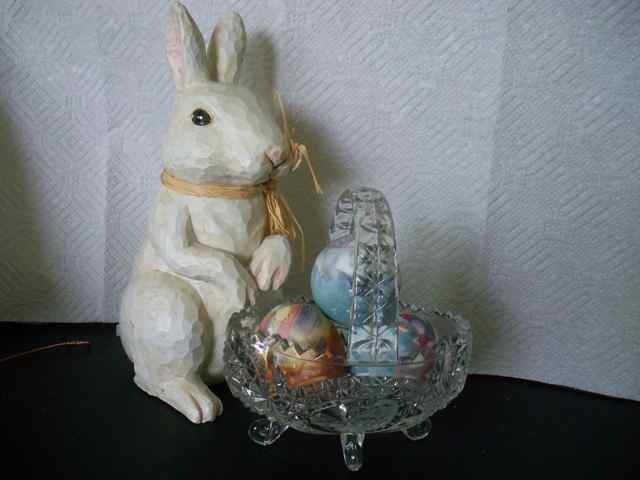 I love the Easter eggs text because it is about the way that we always dyed eggs when I was little. My students had little patience for the process. When they got to Step 5, some of them were downright annoyed. "You mean you could go through all of those steps, get all that fabric and cut it up, and then have it not even work? Why would anyone want to do this?" Ah well, these are the questions that we ask of procedural text. I was tempted to give the assessment at this point. I am trying to be more efficient this year, and compact topics into more manageable chunks. But I just couldn't do it. I wanted students to have some experience with a chronological order text about a historical event. To make the task a little more interesting, I didn't give students the texts right away. Instead, they had some pictures and a map. "What will this text be about?" I asked them. "What clues do you have?" They pieced together the evidence and tried to make some guesses. There was a building on fire,horses pulling an old-fashioned fire truck, and an untitled map of a city along Lake Michigan. The map did have some labels of locations. 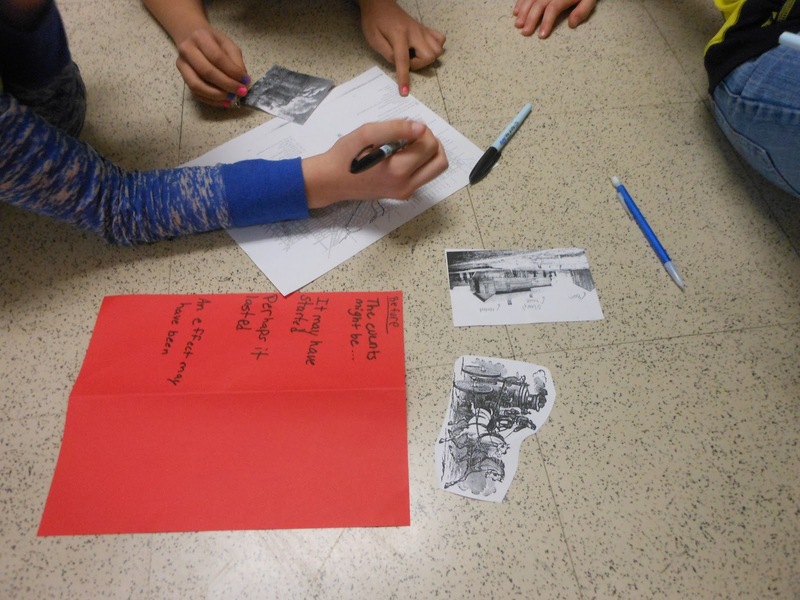 This fifteen-minute activity helped to get the students much more engaged in the text, which they read with their partners. Our next step will be to use the figures to act out the action and to create our own graphic organizers. Will students be able to merge content and structure to make a creative organizer? I hope so. Every year I wonder if I should come up with one theme to unite all of my text structure readings...and every year I enjoy putting together a patchwork of different texts. In the weeks to come, as we look at other structures, we'll revisit the peregrine falcon and the Great Chicago Fire, as well as look at some other topics. Last week, I finished reading aloud There's A Boy in the Girls' Bathroom with my end-of-day class. It was a wonderful moment--we had been working through the book since Thanksgiving, squeezing in five minutes of reading here and there. Despite the fact that we didn't have long blocks of reading time, kids were still able to really identify with Bradley and his emotional journey through the book. They couldn't wait to see what we were going to share next, and had plenty of suggestions. But my choice surprised them. Instead of diving into another novel, I pulled out Saving the Ghost of the Mountain: An Expedition Among Snow Leopards in Mongolia. "I don't like nonfiction," one boy grumbled. "This doesn't look good at all," sighed a girl. But I have a real purpose for sharing this book. The Quest for the Tree Kangaroo, also by Sy Montgomery, is an exemplar Common Core text for grades 4/5. When I saw that Sy Montgomery also had a book about the snow leopard--a big favorite at my house--I managed to get 10 copies of the book for my classroom. I wasn't sure of what exactly to do with the book, however. What would be the best way to use it? How would kids react to it? Instead of jumping in blindly, I decided to start slowly. A read-aloud is the perfect way to get us all thinking about the text. I can really attend to the words and how the text is structured. Kids can share their thinking. And I can begin to figure out how this book will fit into my classroom instruction. It's so important for kids to start reading long-format nonfiction like this! Left to their own devices, intermediate readers gravitate toward short nonfiction books like world record books, joke books, or animal books. These are all fun to read and not without merit. However, kids need the nudge to get into nonfiction that unfolds over multiple pages--that uses a variety of different text structures to explain ideas. To help us all feel immersed in text, I project the text with the Elmo (my first year with a document camera--it's wonderful!) and have a student hand out the remaining copies for students to share. We're already discovering a lot. In the first three pages, we noticed several examples of similes and metaphors. (This was neat, as we have just finished our poetry unit!) Montgomery compares the snow leopards to ghosts, and we talked about why she made this comparison and how she supports it. Now in Chapter 3, we are looking at how she juggles chronological order. Within the broad chronological structure of telling about the expedition's journey to the Gobi, she employs a kind of micro-chronology of what a meal at Nadia's grandmother's house is like. This is real text complexity. As we continue with text structure, I look forward to finding examples of the different structures within this book. Sharing it together is a good first step! 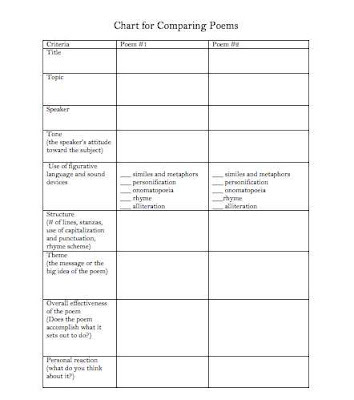 As the last part of our quick unit on figurative language and poetry, the students and I spent the last week looking at how to compare poems and write paragraphs to share our comparisons. Whew. It's a difficult process for students. 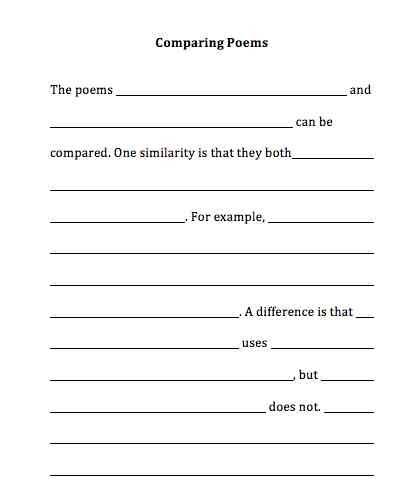 On the one hand, students often spontaneous make comparisons as we move through poems--"That one reminds of me of..." or "This is just like..." However, to write successful comparison paragraphs, students need to learn how to do more thoughtful, thorough comparisons. 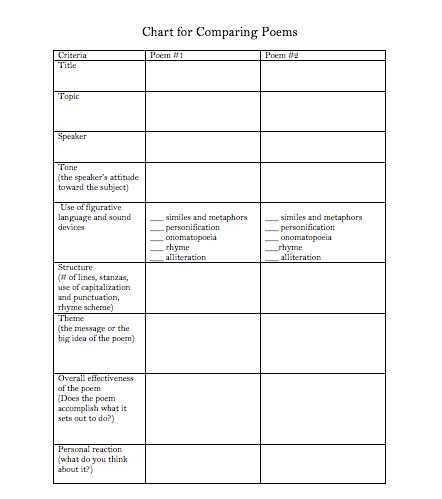 A chart is essential for helping students to compare poems. Sometimes people try to use Venn diagrams for this purpose. Venn diagrams are great for set theory and fun visual gags...but terrible for planning writing! A chart sets up the important criteria for what is to be compared. Because testing season is coming up, I told students that they won't be able to use a prepared chart for our state tests, but that they can make their own comparison charts. It's interesting to watch students use the chart. When I model this for struggling readers, I work with one poem at a time. This kind of careful reading and analysis takes a lot of concentration, and struggling readers often have trouble with the attentional shifts needed to go back and forth between texts. On the other hand, strong readers often prefer to work in the opposite way. They thrive on the extra challenge of going back and forth between texts and often create strong insights, seeing differences in the ways that the author developed the topics. Do we have to fill out the whole thing? That's the beauty of it--I tell students that we only need to fill in 4 or 5 blocks. 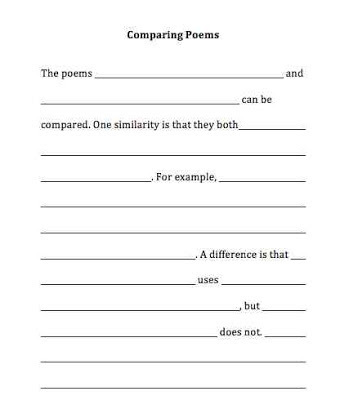 We look for the criteria that are the most interesting for the poems that we have. Interestingly, kids always like to fill in the block for figurative language and sound devices! A scaffolded response frame is useful for students who are still learning compare and contrast structure. Let's face it--this describes just about every elementary school writer! A nice middle level of scaffolding is to project the scaffolded response, but have students write their own responses. Is it formulaic? Yup. Does it lead to scripted, formulaic writing? Some of the responses on the last assessment were the best that I've seen. Helping students with the topic sentence and the transitions freed up some processing space for them to do some deeper thinking about the texts. Kids used quotation marks to show where they were quoting from poems, using specific details, coming up with similarities that I hadn't considered. These are good things! This is the hardest part. It's tempting to stick with poems that have the same topic. But even poems with the same topic don't always make the best comparisons. Last week I chose two hawk poems. The whole lesson fell kind of flat--besides the same topic, the poems didn't really have anything interesting or compelling enough about them to spend a great deal of time talking about. Two poems that worked very well were "Hello, Moon!" by Patricia Hubbell (found in Hey, You! : Poems to Skyscrapers, Mosquitoes, and Other Fun Things) and "The Moon's the North Wind's Cooky" by Vachel Lindsay. These poems both explored the changes in the moon in an interesting way, with lots of differences in the use of figurative language and structure to talk about. Comparing poems was an interesting and rigorous way to end our study of poetry...but I do think that we are all ready to go on to text structure next week! Last week I overhauled the Cause and Effect for Teaching Text Structure packet and added some new texts. Could someone please let me know if they have had success with the download? I'm working on changes to the Figurative Language pack, with some new poems, assessments, and activities to add. I added vocabulary quizzes to the Spring Reading Homework packet. I have added weekly vocabulary quizzes to my classroom this year and I really like the results.